Guide me to resolve above error. 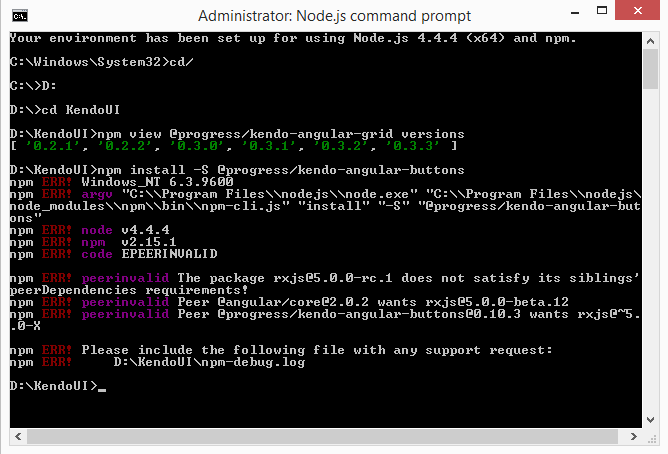 The official Angular examples, as well as Kendo UI for Angular 2, require NPM v3. See this answer for more information on how to update NPM on Windows. NPM will ask you for your Telerik account credentials and an email. Enter the username (if username is email address use everything before the @) and password you use to log in your Telerik account. Not the answer you're looking for? Browse other questions tagged angular kendo-ui-angular2 or ask your own question. How can I update npm on Windows? Angular 2 @progress/kendo-angular-grid will not work with webpack? angular2 kendo UI RTL Languages support?